Jastia Sintav, an Imperial commoner, is a member of the Sintav clan—one of the most respected families in the Imperial City. She lives in the Imperial City's Elven Gardens District with her sister Jena, close by her uncle and clan elder, Iniel Sintav. 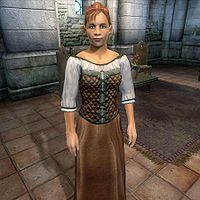 Her brother, Cyronin, has had a dispute with Helvo Atius, who lives in the Imperial City's Talos Plaza District, that has caused bad blood between the Sintav and Atius clans. Jastia has a fairly straightforward schedule. Every day she wakes up at 7am and heads downstairs, where she alternates between wandering around and conversing with her sister for 11 hours. At 6pm, she will sit down to eat dinner for the next hour. At 7pm she exits her house and wanders around the Elven Gardens District, where she shares rumors with the other city folk there. She heads home at 11pm, where she shuffles around for an hour before going into her private quarters to sleep. The exceptions to this schedule are as follows: On Sundas at 9am, Jastia, along with the rest of the Sintav Clan, head over to Iniel Sintav's house. There, they enjoy a twelve-hour family reunion. At 9pm she leaves Iniel's house and resumes her regular activities. On Morndas, Middas, and Fredas at 3pm, Carmana Sintav comes over to Jastia's house for a chat and stays until 9pm. During the Light the Dragonfires quest, Jastia, like most other Imperial City citizens, is confined to her house. Her outfit consists of middle-class attire: a quilted doublet, tan linens, and doeskin shoes. She also has a nominal amount of gold, and the key to her house. When approached for the first time, she will introduce herself with, "Jastia Sintav. Jena's my sister." When asked about the Imperial City, she will gladly reveal her hatred regarding the whole feud with the Atius clan: "I'm sick of all this fighting with the Atius clan. I'm glad Uncle Iniel put his foot down."